Average rating of 4.0 stars from 58 reviews. 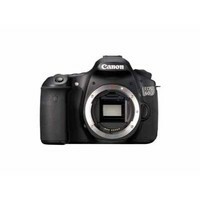 The Canon EOS 60D is the successor to the famed Canon dSLR line up of 40D and the 50D. The biggest improvements over the 50D include more resolution, full HD video and a higher ISO capability. Also updated is a redesigned body with a new swivel LCD. Canon has positioned the EOS 60D towards the advanced amateurs and is primarily touting the better image-capture and in-camera editing along with the the full HD video capture capability. The in-camera editing features now include a ton of stuff which had to be done offline previously. This includes in-camera RAW processing, image copying in reduced resolutions and a full suite of post-processing image filters. HD video capture is now available at 1920x1080 resolution with frame rates of 30p, 25p and a native 24p - enabling a more polished look which was previously possible only after post-processing. 1. A large vari-angle 3-inch clear view LCD screen with around 1 million dot VGA resolution. 2. A huge 18-megapixel Canon CMOS sensor. 3. Proprietary DIGIC 4 Imaging Processor. 5. Canon's exclusive iFCL Metering System (Intelligent Focus, Color, Luminance) giving it the power of a professional-level camera. The Canon EOS 60D boasts of an excellent image quality hands-down according to almost all the experts - no exceptions. What is more impressive is the fact that this excellent image quality spans the entire ISO spectrum. Steve's Digicam claims excellent full size prints all the way from ISO 100 to 1600. PC World chimes in with a very good image qualty even at ISO 3200. The EOS 60D HD video recording also earned top marks from most the experts. The icing on the cake is the tons of recording options that the 60D comes loaded with. The reviewers at Macworld also showed high approval of the audio quality captured with the video. The Canon EOS 60D has a pretty good handling supporting a solid and nice grip. The new Vari-angle LCD receives high marks from most of the experts amd PC Mag superlate's it to 'gorgeous'. The menu is also well designed and easy to use according to most experts. The battery life of the 60D is also pretty good. DCRP (Digital Camera Resource Page) went so far as to claim it to be the best battery life in its class. Most other experts including PC World and Macworld seem to agree about the good battery life. Combing gorgeous images, amazing videos, great handling, good battery life and tons of in-camera editing options the Canon EOS 60D definitely sets a new benchmark as far as mid-level DSLR's are concerned. The only thing that spoils the party is the lack of continuous autofocus while video recording. The EOS 60D is a very good buy for a mid-level DSLR given the fact that its prices are hovering around the $1000 range right now, though buyers should also check out the Nikon D7000 before making a decision. Additionally, if the EOS 7d is too expensive, then the EOS 60D might just be the right priced DSLR (with video) for you.